So you signed the Official Secrets Act (Section III) in blood. You have done the right courses in everything from “Introduction to Applied Occult Computing” and “Basic Computational Theory” to “Surveillance and You: A Field Guide” to “The Paper Clip Audit Procedure.” You got cleared for field duty so now you get to protect the United Kingdom plus her dependencies (and the European Union and the USA and the rest of the world in that order) from the filth of the multiverse. Except that does not happen every day, thankfully. So most of your day means a commute into the centre of London, logging on and starring at your computer screen dealing with one dull memo after another in between attending even duller meetings before trudging back home. It is all go for the life of an agent of The Laundry, the United Kingdom’s most secretive agency tasked with protecting the country from entities from beyond. Okay. Mostly it is not, but being a field agent means that you are likely to receive telephone calls at four in the morning. Which probably means overtime and expenses and paperwork, and overtime and expenses means that the country is in danger. Paperwork the Laundry does all the time even if the end of the world is nigh… Still a 4am “Black Bag Job” means fun and excitement and a chance of death and a chance that the world might end if you fail. No pressure then. Still your healthcare plan is up date – isn’t it? 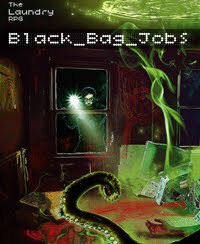 Black Bag Jobs, the first supplement from Cubicle Seven Entertainment for The Laundry, its RPG based on the “Laundry Files” series by Charles Stross, brings together six scenarios designed to scare the field agents with the fundamental truths about the universe. Each of the six can be run as single scenarios or one-shots, or be run as a part of an on-going campaign, one that exposes the player characters or agents to The Laundry’s darker secrets and its darker fears. Any one of the six can be run in a single long session or perhaps two. It opens in rip-roaring fashion with “Case: Lambent Witch” which has the agents sent out to a North Sea oil rig that has gone silent. Somebody might be drilling in the wrong place and thus broken the terms of the treaty with a certain ocean floor dwelling species. The scenario has the feel of the film Aliens, but requires more than firearms to solve. It is followed by “Lost and Found,” which has the agents dealing government bureaucracy and inter-departmental politics when they have to find a lost laptop – which has all of the wrong software on it (Mythos tomes in PDF, anyone?) – and deliver a briefing to a new Parliamentary Private Secretary. The third scenario, “The Shadow Over Kafiristan” takes its cue from Kipling’s The Man Who Would Be King and the Great Game as much as it does the current situation in Afghanistan. The agents are sent out into the field to ascertain whether or not a local warlord would make a good ally after he is spotted sporting an occult tattoo. Is he a mere worshipper or an actual practitioner of sorcery? After all the stress of the previous missions, the agents get to relax and go on a retreat, except that whilst there, they are to run a discreet security check upon the new facility. Given that the title for the scenario is “The Wild Hunt” and that it is set in the West Country, this is probably not the getaway that the Med & Psych Department promised you. In “Secret Agendas,” the sextet mixes up the occult with the classic paranoia of the espionage genre as the agents are tasked with ferreting out a potential traitor. The job is made all the more interesting because the agents get to investigate the suspects in both the waking and the dreaming world, all three of which will be placed under a Truth Compulsion Geas. The last scenario in the book, “The Signal,” provides the agents with a glimpse of the much feared CASE NIGHTMARE GREEN as the agents have to follow a strange signal that comes from off world, much in the same manner as the ending of The Atrocity Archives. If used as a campaign, this scenario brings the anthology to something of a downbeat ending rather than a climax. This should not really surprise the characters, who after all, are not going to receive much in the way of plaudits (there is though, always the index linked pension) and should still realise that the end of the world with the advent of CASE NIGHTMARE GREEN is nigh. Physically, Black Bag Jobs is well put together. It uses the same layout as The Laundry RPG, but the tighter page count means that there is more artwork and other features that break the text up. The interior artwork itself is also good. In addition, all of the scenarios come with their own handouts, all of them nicely done. I would recommend a buff folder or two in which to present them to the players at the appropriate time. The highlight of the book is the author’s successful effort to capture the feel of the bureaucracy, the politics, and attitude of British government institutions with their weariness, small mindedness, and stubborn natures. These are all very English scenarios, ones that draw heavily from the United Kingdom’s relatively recent political and geo-political concerns, whether it is Afghanistan, North Sea Oil, and civil servants losing laptops. A vein of knowing humour runs throughout the six, some of which is laugh out loud funny, and much like the novels themselves, is very British in tone and feel. Were I to select a favourite scenario from the collection, it would be the first, “Case: Lambent Witch.” It starts the collection with a bang and is the one that feels the most similar to Stross’ fiction. Others like “Lost and Found” and “Secret Agendas” explore the paranoia that come with the espionage world before giving the occult twist, while “The Wild Hunt” plays off some of the fiction’s more absurd elements. The last scenario “The Signal” is perhaps the least pleasing and the least interesting. In part because it takes the agents away from The Laundry and its internal bickering, and because it takes the GM’s game towards the forthcoming apocalypse that is CASE NIGHTMARE GREEN, and preventing that is more interesting than actually having it occur. Although the six scenarios are written for The Laundry RPG, there is material here that a Call of Cthulhu Keeper could use in his campaign. Perhaps the easiest scenario to adapt is “The Wild Hunt” because its set up involves The Laundry the least, so that could easily be removed. Conversely, the more that the scenarios are written around The Laundry, the harder they are to adapt, at least for Call of Cthulhu. Running some of them for Delta Green might be possible. If you already have a copy of The Laundry RPG and want more, then Black Bag Jobs is an obvious purchase. If the GM makes that purchase, then he will a solid set of six scenarios that are in turns engaging, exciting, and entertaining – and sometimes funny too.